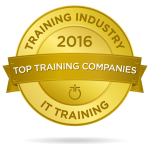 Fast Lane is proud to announce that for the eighth year in a row, they have been included in TrainingIndustry.com’s list of Top 20 IT Training Companies. The list encompasses a group of companies recognized for their ongoing mission to be one of the best providers of training services. Presented in several key areas of the workforce development industry, TrainingIndustry.com’s Top Companies Lists help organizations connect with the right training partner to increase productivity and potential.